Award winning author, speaker and producer Jenny L. Cote developed an early passion for God, history and young people, and beautifully blends these passions together in her two fantasy fiction series, The Amazing Tales of Max and Liz® and Epic Order of the Seven®. Likened to C.S. Lewis by book reviewers and bloggers, Jenny L. Cote opens up the world of creative writing for students of all ages and reading levels through fun, highly interactive workshops. Jenny has appeared to over 25,000 students at lower, middle, high school and universities in the US and abroad. Jenny’s passion for research has taken her to London (with unprecedented access to Handel House Museum to write in Handel’s composing room), Oxford (to stay in the home of C.S. Lewis, ‘the Kilns’, and interview Lewis’ secretary, Walter Hooper), Ireland, Paris, Normandy, Rome, Israel, and Egypt. Her books are available online and in stores around the world, as well as in multiple e-book formats (Kindle, Nook, etc.). Jenny holds two marketing degrees from the University of Georgia and Georgia State University. She lives in Roswell, Georgia, with her husband Casey and son Alex. Learn more about Jenny at www.epicorderoftheseven.com. The Amazing Tales of Max and Liz® is a two-book prequel series that begins the adventures of brave Scotty dog Max and brilliant French cat Liz through the stories of Noah’s Ark and Joseph. Book One: The Ark, the Reed, and the Fire Cloud (2009 Reader’s Favorite Gold Award for Children’s Chapter Books) is in pre-production for an animated series and feature film adaptation, DVD school curriculum and VBS program development. Book Two: The Dreamer, the Schemer, and the Robe (2010 Reader’s Favorite Gold Award for Children’s Chapter Books) brings Max, Liz, and friends to work behind the scenes in the life of Joseph in the land of Egypt. The Epic Order of the Seven® series picks up where the Max and Liz series left off. Book One: The Prophet, the Shepherd, and the Star (2011 Reader’s Favorite Gold Award for Christian Historical Fiction) gives Max, Liz, and the gang their most important mission yet: preparing for the birth of the promised Messiah. Their seven-hundred–year mission takes them to the lives of Isaiah, Daniel, and those in the Christmas story. Book Two: The Roman, the Twelve, and the King (2012 Readers Favorite Five Star and Bronze Awards for Christian Historical Fiction) unfolds the childhood, ministry and passion of Jesus Christ with a twist – his story is told within the story of George F. Handel composing Messiah. 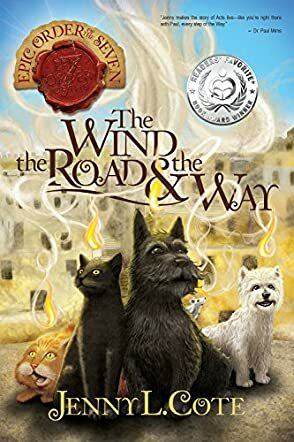 Four more books remain in the series: The Wind, the Road, and the Way (2014), The Fire, the Revelation, and the Fall (2017), The Voice, the Revolution, and the Jewel (2016), and The Professor, the War, and the Muse (2019). What a scary time it must have been for the disciples and those who had been following Jesus, after He was crucified on that cruel, rugged Roman cross. But the most amazing resurrection happened and Jesus is not dead. He has risen from the dead and is alive. And the disciples, with the help of the Holy Spirit, will carry on the command made by Jesus before His death, and that is to tell the world the Gospel, and of the death, burial and resurrection of our Lord and Savior, Jesus Christ. And this wonderful Gospel story is played out in this most inspiring and entertaining book, The Wind, the Road and the Way by Jenny Cote. This is my first book by author Jenny Cote and it was an amazing read. I love how the characters fell right into place, bringing the story together before my eyes in each scene. Ms. Cote takes the story that we celebrate at Easter, the story of the death, burial and resurrection of Jesus, and gives her readers a vivid example of how life may have been like for those living during those early days. I loved the biblical history and getting to know the lifestyles and historical details of the early days talked about in Acts. But most of all, I enjoyed the way Ms. Cote takes the Gospel of Jesus and weaves it throughout the book and the lives of the people. The redemption message is clear; Jesus died on the Cross for the sins of mankind. And He can and will change the hearts of those who trust Him. Nothing is impossible for Him. If you enjoy biblical fiction, I highly recommend The Wind, the Road and the Way by author Jenny Cote. I just know you will enjoy this book as much as I did. Thank you, Ms. Cote, for an amazing account of God’s love for us. I have enjoyed each book in this series. The Wind, the Road and the Way is excellent! To be enjoyed by both young and mature readers.I can't wait to read the next one! Mrs. Cote is an amazing storyteller.